Yes, Elfis is back in a wonderful new musical that is destined to be a favorite of your singers and audiences alike. Everyone in the village of Icebergia is shivering with excitement when they hear that the Arctic-renowned band "Elfis and The Sleigh Riders" is coming to perform at the Snowflake Festival! The King and Queen have invited everyone in the entire Kingdom of Frozonia to attend, including all the princesses who live in the land. All except one – The Abominable Snow Princess. An oversight or a deliberate act of omission? No matter to her. An affront is an affront. 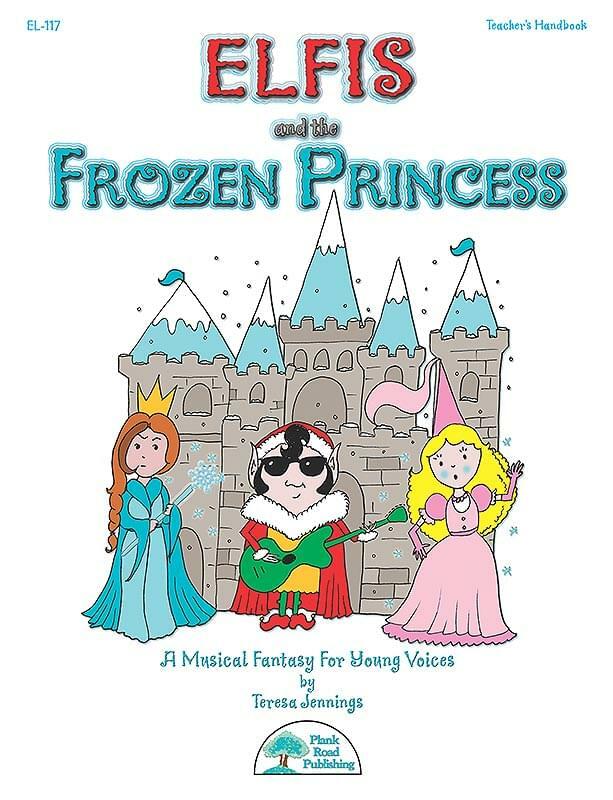 After crashing the Festival, the Abominable Snow Princess takes her revenge by casting a freezing spell on Snowella, the daughter of the King and Queen. Snowella is unable to move! Despite the usual efforts to break a spell, nothing seems to work. Until, that is, Elfis steps forward. A gentle song sung tenderly to a scorned princess is the only way to thaw a frozen heart. And then it turns out the omission was a big mistake anyway, so there are plenty of messages to reinforce here: kindness, forgiveness, acceptance, peace, and of course, letting it go. While the wintry setting and characters (including elves) makes for a good holiday performance, it does not mention any holiday in particular. So you could really use it in any season. There are a number of speaking and non-speaking parts aside from the main characters – princesses, princes, reindeer, snowmen, townsfolk, miscellaneous creatures and characters – which can be adapted freely to increase or decrease the size of your cast. Approximately 20 minutes long, the musical includes five songs and a lighthearted script with short, easy-to-learn lines for your characters. As with all of our revues and musicals, there is a thoughtfully designed Teacher's Guide, with lots of suggestions for making a great performance. Also included are reproducible Singer's Parts, lyric sheets, posters, and program covers.